UM creative writing professor of practice Patricia Engel’s new book, The Veins of the Ocean—chosen as the 2019 One Book, One U—inspires hope and seeks to eradicate imagined borders. As the child of immigrant parents growing up in New Jersey, Patricia Engel, a professor of practice with the University of Miami's Creative Writing Program, loved writing stories and captions for the pictures she sketched in her journal. She spiraled through childhood engulfed in the imaginative world of storytelling, yet always keeping her writing to herself, never publishing, and never imagining that writing could become a career. "I continued to write, but had no idea how someone becomes a writer. My parents didn’t know, and no one—even at my large college—stopped me to say 'you could major in creative writing,'" said Engel, whose writing has been compared to that of Gabriel García Márquez and who, in recent years, has garnered a range of prestigious literary awards—including the first woman to receive Colombia’s national literature prize. 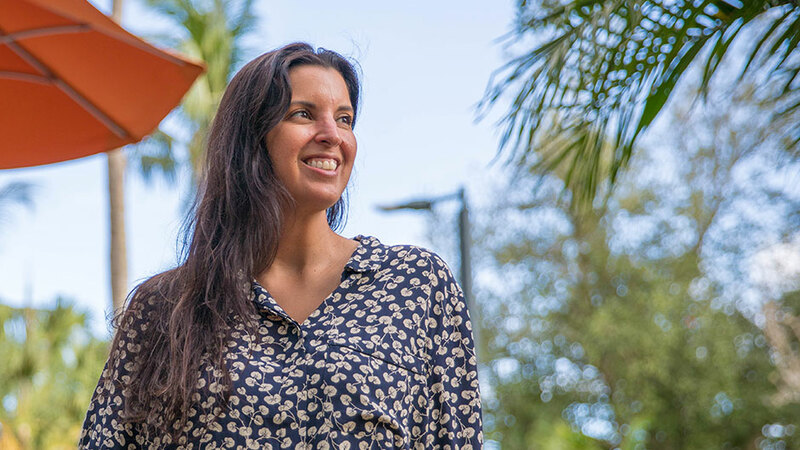 Yet the muse bumped and prodded her, and after studying, living and working in New York City for years, she followed her storytelling star to South Florida, completed a creative writing program, and launched an impressive writing career. UM readers get a special invite to savor Engel’s talent. Her third and newest novel, The Veins of the Ocean, has been selected to be the 2019 One Book, One U common book. Common books, increasingly standard at colleges and universities across the country, create a shared educational experience for the university community. While at some schools the common book is required freshmen reading; at UM, students, faculty, and staff are simply encouraged to read and share in dialogue and exchange around the book’s themes. Engel hopes that her book, winner of the 2017 Dayton Literary Peace Prize, will open readers’ eyes to the beauty of the South Florida landscape—and encourage a more active and profound appreciation. "It’s a very South Florida book and explores things that people here don’t think about that much—incarceration in our state, how we live so close to the ocean and pride ourselves on how much we love it, but still we exploit marine life and the environment," explained Engel. "Our campus here at UM is so beautiful. But there’s a risk in campus life—it can be a bit insular," she cautioned. While The Veins of the Ocean takes place largely in South Florida, the story moves between Cuba, Colombia, and the Florida Keys. The book explores intergenerational trauma—the displacement and separation of families, and the types of trauma "that we often don’t understand, that are experienced as a kind of sadness or melancholy," according to the author. Engel said that all her books have described the lives of families that have emigrated—in different ways. "In this book, the narrator Reina was brought here as a baby—a passive immigrant experience—yet she falls in love with Nesto, a man from Cuba who decides on his own, as an adult, to fracture his family and emigrate—that’s on him, and we see how these different kinds of immigrant experiences play out." In Engel’s personal life, her parents emigrated from Colombia, and she was born soon after in the United States. "As a result, my whole life has been that of an immigrant, being seen by society as 'other,' seeing my rights and citizenship constantly questioned," said Engel, who holds dual citizenship. The 2019 One Book, One U launches officially with the spring semester. At least one author reading will take place in February and highlight a series of satellite events that will take place during the semester. "We had such an exciting One Book, One U last year—so many turned out for the author’s reading, and the conversations all semester long were all really encouraging and made us want to do it again," said Chantel Acevedo, associate professor in the creative writing program, a main coordinator of the initiative again this year. UM's office of institutional culture is featuring the project on its website as a component of the culture of belonging initiative, and serves—through its Jesse Ball Dupont grant—as an initiative sponsor, along with the school of law, the program in women’s and gender studies, English department, student activities and student organizations, the college of arts and sciences, while other university organizations and departments are providing space for planned events. The calendar of 2019 One Book, One U events will be confirmed in coming weeks.